Having allergies, eczema, asthma, food intolerances or coeliac disease CAN be a gift, though it might sometimes feel like a curse. If you write New Year’s resolutions every year and struggle to keep to them, why not explore the idea of continually viewing this as a chance to change, to be better and to improve your life. Don’t just write a list, put it away and discover the following year that you didn’t really achieve any of them. This year aim to discover and explore food and life avoiding certain allergens, turn things upside down and look at food in a totally new way; explore all the foods you CAN eat and celebrate them. If you didn’t have allergies you may well be grabbing unhealthy snacks, eating fast-food or dining out with friends with little thought for the consequences. Whilst it may seem hard having to always remain vigilant, making the healthy choice will have a positive impact on your overall wellbeing. Something you could try this year is to really focus on all the positive things that happen in your life. If you write regularly then why not start or end the day by recapping all the inspiring things that happened that day. It could be anything, from an amazing new freefrom product you found in the supermarket to getting great service in a local cafe. It could also be something totally unrelated to your allergies or food sensitivities – don’t let your allergies define you. It could even be the joyful sunrise you saw on your way to work. You have allergies but they shouldn’t rule your life in a negative way. 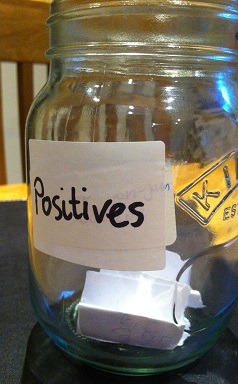 The idea is to write something positive on a piece of paper and pop it into the jam jar each day. Then at the end of the year when it’s time to think about New Year’s Resolutions again, read all the things that happened and it should help you find a more positive outlook on living with allergies, food intolerances or coeliac disease. Here are five ways to be thankful for what life deals you and remain positive and prepared in 2014. It is a gift – Limiting your diet can be hard work, but there are always substitutes and no matter what allergens you cannot eat, there are absolutely hundreds and thousands of foods that you CAN. All meat, fish, fruit, vegetables, grains etc. which in their raw state don’t contain allergens; eating a more natural, home-cooked diet will also improve your health. Demand support – Don’t get fobbed off by your doctor. If you feel you have questions and want to be referred be strong, confident and push for answers. Keep a strict and detailed food, symptoms and mood diary if you are experiencing unexplained allergic reactions. It will help remind you and also aid the diagnosis of which food might be causing problems. And even if you are already seeing a specialist, if your symptoms are getting worse or you are really struggling, speak to them about other treatments and ask for help. Don’t just suffer on in silence, allergies can change over time, new ones can appear and old ones can become more severe or even disappear in rare cases so it’s important to keep on top of you what’s going on in your body. Go processed-food-free for a week – Every year the array of Freefrom foods in supermarkets and health food stores is growing. Many of these are healthy and natural but some contain lists of ingredients you might not be able to identify. Freefrom is not always healthier – read labels, understand exactly what you’re eating and analyse the salt, fat and calorie content. Why not try eating only natural, fresh food for a whole week and see how you feel? Get creative in the kitchen – Read allergy friendly cook books and try out new recipes. Make batches of soup, stews, and curries etc. and fill tubs or foil containers so you can freeze meals for those days when you can’t face cooking, then heat directly in the oven – just like a take-way! Check your injector expiry dates – You may already have checked your pen after the recent Jext recall in Dec 2013 but if not, start the year by making sure your injectors and inhalers are within date and register for the expiry reminder services that both Jext and Epipen provide. Focus on the positive experiences you have this year and you will gain the confidence to demand better support and also to explain yours or your child’s allergies to friends, family etc. The key is in being prepared and organised, spreading awareness and demanding better. So have you written any New Year’s Resolutions yet? Are any of them allergy related? Hi, Great post Ruth, you mention all good points & they are very helpful for all of us. We are waiting for your next blog.